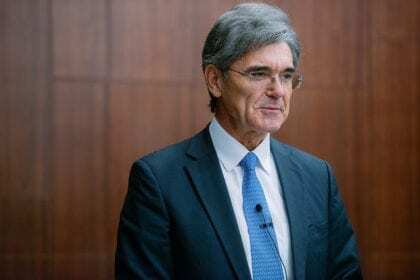 On November 20, Süddeutsche Zeitung reported that Joe Kaeser, CEO of the multibillion-dollar engineering company Siemens AG, has demanded a basic income. According to the news report, Kaeser, speaking at the Süddeutsche Zeitung Economic Summit in Berlin, said that a basic income would eventually be necessary to protect workers who become displaced due to artificial intelligence and automation. Subsequently, many readers credited Kaeser with support for unconditional basic income (bedingungsloses Grundeinkommen), as endorsed by BIEN. 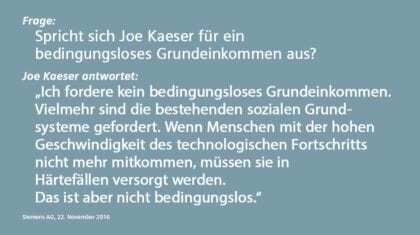 While Kaeser believes that the state must offset the hardships faced by those whose jobs are adversely affected by technological progress, he does not believe that the support must be unconditional. Despite Kaeser’s own subsequent disavowal of UBI, the initial (and perhaps misleading) news report generated a surge of interest in the idea. Süddeutsche Zeitung itself–Germany’s largest subscription newsletter–followed its article about Kaeser with a week-long series on basic income. One article revisited the ideas of Götz Werner, the billionaire founder of the drugstore chain Drogerie Markt who called for a universal and unconditional basic income of 1000€ per month. Others provided further commentary on Kaeser’s initially reported statement that a “kind of basic income” will be unavoidable in the face of automation. In comments to Basic Income News, Ronald Heinrich of the basic income political party Bündnis Grundeinkommen described Kaeser’s remarks as a “tipping point” in German media coverage of basic income. For the second time, I have posted a comment which has been rejected as spam Why? If it is because I do not sign up for the newsletter, that is because I already receive it, so please do NOT send me duplicates. Kaeser has clearly not thought through the case for the UBI As Germany’s benefits are means tested, t should be easy to counter his retraction. But I appear to remain the only person who sees the UBI as necessary to underpin any attempt tos top trashing the ecosphere.